In whatever decade you first discover it, Mavericks is a great album. From the Byrds to Tom Petty, early R.E.M. to mid-'90s bands like Toad the Wet Sprocket and Gin Blossoms, there has long been something sweetly exuberant about the clean, crisp jangle of a guitar. Such tones from such bands seem to somehow express an ideal or the idea of freedom in the midst of an average, everyday existence. Especially when coupled with glowing harmonies, the sound typified by such bands has often been a part of some very glorious, very timeless rock and roll. 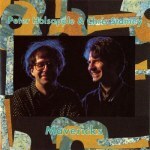 In 1991, Peter Holsapple and Chris Stamey released Mavericks, and more than 16 years later, a listen to the album's reissue all the more assures its deserved place along the timeline of great heartland/jangle rock recordings of all-time. Formerly of North Carolina-originated band the dB's, which opened for R.E.M. in the late '80s (the connection between the bands continued with Holsapple touring at times with R.E.M. and playing on their 1991 masterpiece Out of Time), the pair reconvened for this project. "Mavericks may be our most enduring record together. It's the album that people relate to most easily. Is it because it's more lyrically mature than a dB's record? Less combo organ? More acoustic-based? It certainly is less frenetic and nervous, but you can still tell it's Chris and me at work…. My musical partnership with Chris has yielded some fine music, and Mavericks is among the best of all." Ascertaining the value and truth in those assessments seems a job best left to the performers and longtime dB's fans, but the album certainly is a mature, melodic gem with more than a few memorable tracks. The project pricelessly starts with "Angels", a track about those guardians of soul that is quirky yet somehow straight-ahead, built on the pair's vibrant harmonies and the delicate momentum created on acoustic guitar. As the record continues through its best moments, listeners are treated to a "I Know You Will" that sounds a bit more dated than other tracks, but still possesses a special spark, the '60s-flavored, harmony-drenched "I Want to Break Your Heart" is soaring and tuneful, and "Geometry" uses math and science surprisingly well to illustrate the difference between lovers. Throughout all of these songs, the band's strengths (capable guitar playing, first-rate songwriting, and vocal cohesion) are clear and consistently relied upon. "When Chris and I sing together, it sounds natural and good," writes Holsapple in the liner notes. "Neither of us are Carusos, but the combination of our voices is identifiable immediately and they're well-matched; maybe it's that 'whole is greater than the sum of the parts' concept." Holsapple's estimations here are certainly on display throughout the record. Ultimately, the six aforementioned bonus tracks don't add a lot of depth to the recording or reveal much about the process or sessions. The best of those included are the "original demo" version of "Angels" and the closing "I Knew You Would". As the 1991 album version of the former is one of the record's best tracks, a second rendering is welcome. The latter is a satisfying and expansive track that does serve as an excellent coda and to round off the project well. dB's fans will certainly appreciate how Mavericks recalls the talents of their leaders and showcases them in a very becoming setting. Those with little exposure to the artists would do well to experience the project, too. Timeless elements of rock and roll are present here, executed with grace and precision. In whatever decade you first discover it, Mavericks is a great album.